Hawaiʻi Kai is a largely residential area located in the City & County of Honolulu, in the East Honolulu CDP on the island of Oʻahu. Hawaiʻi Kai is the largest of several communities at the eastern end of the island. The area was largely developed by Henry J. Kaiser around the ancient Maunalua fishpond and wetlands area known as Kuapā (meaning "fishpond wall"). The Hawaiʻi Kai or Koko Marina was dredged from Kuapā Pond starting around 1959. Dredging not only transformed the shallow coastal inlet and wetlands into a marine embayment, but was accompanied by considerable filling and clearing of the pond margins. In 1961, Kaiser-Aetna entered into a lease agreement with the land owner, the Bernice Pauahi Bishop Estate, to develop the 521 acre (2.11 km²) fishpond into residential tracts with a marina and channels separated by fingers of land and islands upon which house lots and commercial properties would be laid out and developed (ACOE, 1975). Nearly all of the low-lying lands surrounding the marina have since been developed, and neighborhoods now extend back into the several valleys and up the separating ridges. Immediately west of Hawaiʻi Kai along Kalanianaole Highway (State Rte. 72) is the East Honolulu neighborhood of Kuliʻouʻou. Eastward from Hawaiʻi Kai on the same highway is the Koko Head area, an area now mostly included within Koko Head Park. South of Hawaiʻi Kai is Maunalua Bay, and north are the Koʻolau mountains. Eventually the road crosses over to the windward side near Makapuʻu Point. Hawaii Kai is located approximately 12 miles east of the Central Business District (CBD) of Honolulu. Kalama Valley is a community within the town of Hawaiʻi Kai located on the eastern coast of the island of Oʻahu. It features a shopping center, a public park and basketball facilities, and predominately single-family, relatively high-priced housing, due to its location in Hawaiʻi Kai. Previously, the shopping center held a convenience store, auto care center, Chinese restaurant, Thai restaurant, and church. As of 2008, the Thai restaurant and auto care center are all that remain. There have been rumors in the past of other businesses possibly opening up in the rather new and empty looking center, but there has yet to be any additions to the shopping center, except for a recycling point in its parking lot. 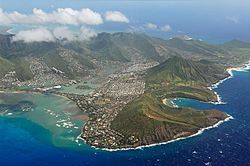 There are a variety of attractions in the vicinity of Kalama Valley, including Hawaii Kai Golf Course, Sandy Beach, Makapuʻu Lighthouse and beach, Koko Crater Botanical Garden, the "From Here to Eternity" cove, and Hanauma Bay. Sandy Beach, is a picturesque and sandy beach park barely a mile away from Kalama Valley. Sandy Beach is a popular beach for the local crowd, and, due to its quiet location and powerful waves, is a hot spot for body surfing and rarely overcrowded with tourists. Koko Crater botanical garden encloses beautiful plumeria trees and plants from different regions of the world. There is an easy hike up to Makapuʻu lighthouse, which overlooks the beautiful Makapuʻu Beach, Sea Life Park and the windward coast. In the winter it serves as a whale watching look out. As a marine-life sanctuary, Hanauma Bay is idyllic for snorkeling. "Kamehame Ridge" is a ridge located in the middle of Kalama and Kamilo Iki Valley. Kamehame Ridge was developed during the 1990s. Now there are multi-million dollars homes and real estate stretching from the bottom to the top of the Ridge. Most famous for its popular hike, known locally as “Dead Man’s Catwalk,”. This hike is a paved road that ascends quickly and easily to the top of the Ko’olau Mountains. Despite its death-defying nickname, this hike is rather a mellow stroll, providing walkers and hikers stunning views of Oahu’s windward coast. The air is often filled with hang gliders, enthusiastically performing for the eager onlookers. But the main attraction for most is a concrete slab protruding out from the ridgeline – the “Dead Man’s Catwalk.” This icon makes for a beautiful photo, but please use caution as you walk onto the protruding slab. In total, the hike takes about 45 minutes to an hour, walking shoes, water, and sunscreen is a must. Warning, there is a security guard who patrols the area daily. There have been cases where trespassers are giving warnings or citations; enter at your own risk. Hawaii Kai was home to 30,079 residents residing in 10,702 households during the period between 2009-2013. The percentage of residents 25 and older with a bachelor's degree or higher was 51.8 percent. Hawaiʻi Kai is located within the Hawaiʻi Department of Education Kaiser Complex and is home to Henry J. Kaiser High, Hahaʻione Elementary, Kamiloiki Elementary, and Koko Head Elementary Schools. The three elementary schools feed into Niu Valley Middle School, which in turn feeds into Kaiser High, although Niu Valley Middle is not located in Hawaiʻi Kai. The view of Hawaii Kai from the nearby lookout point. ^ "Ridge: The Fastest Route To The Ko'olau". Exploration: Hawaii. Archived from the original on 2014-11-22. ^ "homes for sale in Hawaii Kai can be found at any given time". Retrieved 2017-03-24. ^ "EDUCATIONAL ATTAINMENT: HAWAII KAI VS. HONOLULU AND THE STATE". EastOahu96825. U.S. Army Engineer District Honolulu (ACOE). 1975. Final environmental statement for Department of the Army permit applications in the Hawaiʻi Kai Marina, Oʻahu, Hawaiʻi. 52 pp. + appendices. This page was last edited on 10 April 2019, at 03:33 (UTC).